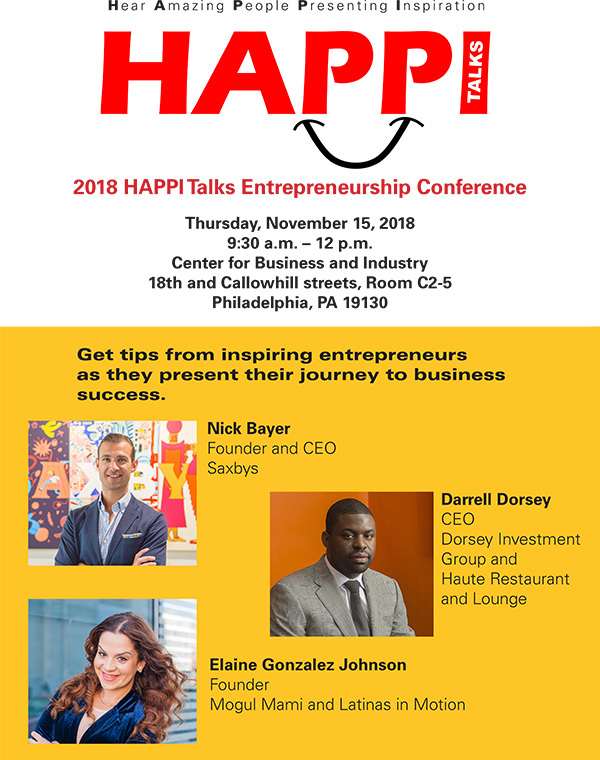 Get tips from inspiring entrepreneurs as they present their journey to business success. When he created Saxbys in 2005, Nick Bayer never considered it to be a coffee company—instead, it’s a social impact company fueled by amazing food, beverage and hospitality. Saxbys has since grown from one corner café to a 30-unit business with a singular mission: Make Life Better. As the founder and executive director of Latinas in Motion, Elaine Gonzalez Johnson inspires and empowers women to exercise and adopt healthy habits. She will share the key steps she took on her path to success. Dorsey Investment Group purchases and converts properties into rental housing and/or dream homes. With his recent purchase of Haute Lounge on the Avenue of the Arts, alumnus Darrell Dorsey now seeks to build a culinary empire.